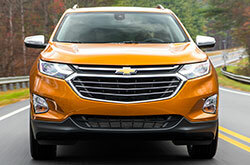 What Does the New Equinox Offer? The 2018 Chevrolet Equinox in Evansville has received a full redesign for the new model year. The Equinox is a lean and stylish SUV that is capable of suiting any of your needs. Each Equinox is comprehensively equipped with modern conveniences and technologies. 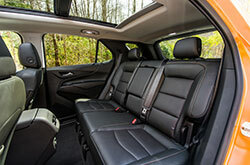 The redesign also has made good use of the interior space to comfortably hold both passengers and cargo. 2018 Chevrolet Equinox reviews praise the style and function of the new redesign that makes it comfortable and fun to drive. There are four trim levels available for the 2018 Chevy Equinox in Evansville. The base trim is the L. Standard features on the L include keyless entry and ignition, a 7-inch touchscreen, USB and auxiliary ports, a built-in Wi-Fi hotspot, satellite radio and a six-speaker sound system. The LS adds a compact spare tire and carpeted rear floor mats along with other optional feature packages. The LT gets heated mirrors, a power driver seat and optional feature packages. The top-of-the-line trim is the Premier which has the previous features as well as upgraded leather upholstery, heated front seats, driver memory settings, an upgraded touchscreen and remote start. 2018 Chevrolet Equinox reviews highlight the incredible functionality of each of the trim levels. 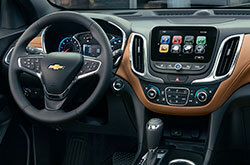 All of the Equinox options are outfitted with modern features and conveniences that make it an excellent choice. For the 2018 Chevy Equinox there are three engine options. The first is the turbocharged 1.5-liter four-cylinder engine. It produces 170 hp and 203 lb.-ft. of torque. Next is the turbocharged 2.0-liter four which has an output of 252 hp and 260 lb.-ft. of torque. The final option is the turbocharged 1.6-liter diesel engine that can make up to 136 hp and 236 lb.-ft. of torque. There is also the option of front- or all-wheel drive as well as the choice of six-speed automatic transmission or a nine-speed automatic transmission. You can get in and drive the Equinox with confidence as it is equipped with many of the expected safety features, all of which are designed to help keep you safe. Standard safety for the Equinox includes stability and traction control, a comprehensive set of airbags and tire pressure monitor. A rearview mirror, rear park assist, forward collision alert and a Teen Driver mode are also offered. 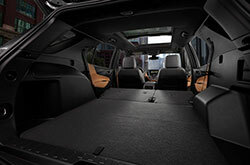 Discover All the Latest Specifications on the Chevrolet Equinox! 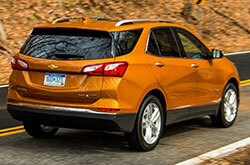 If you've been looking for car models like the 2018 Ford Escape, Honda CR-V, Toyota RAV4 and the Buick Encore near Evansville, you should mull over the 2018 Chevrolet Equinox. Its in-car technologies and eye-catching exterior styling might just seal the deal if you're looking at a series of cars. Once you're done with our 2018 Chevrolet Equinox review and compare page, check out new Chevrolet finance offers. 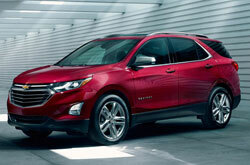 We're a local Chevrolet Equinox dealer with the latest factory incentives on new and pre-owned vehicles. We hope our 2018 Chevrolet Equinox review helps when you're all set to make your eventual buying decision. Our assortment of handsome Chevrolet Equinox models at Kenny Kent Chevy in Evansville, IN is massive. Email to schedule a test drive and come see our lineup. Also take a moment to watch our video, which showcases the car's premium cabin equipment! Purchase prices do not include tax, title, license and $199.00 doc fee. Prices include the listed rebates and incentives. Please verify all information. We are not responsible for typographical, technical, or misprint errors. Inventory is subject to prior sale. Contact us via phone or email for more details. *MPG Based on 2018 EPA mileage ratings. Use for comparison purposes only. Your mileage will vary depending on driving conditions, how you drive and maintain your vehicle, battery-pack age/condition, and other factors.